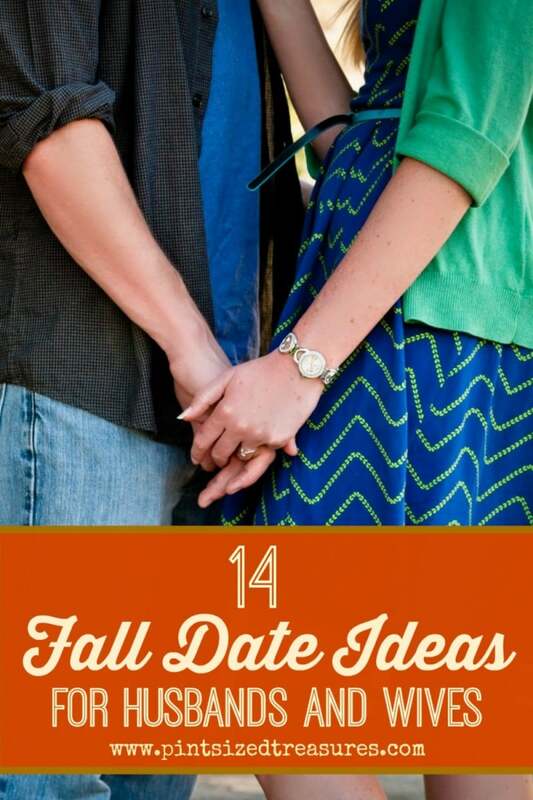 Home › Marriage › 14 Fun and Creative Fall Date Ideas You’ll Absolutely Love! — they’re exactly what your marriage needs! 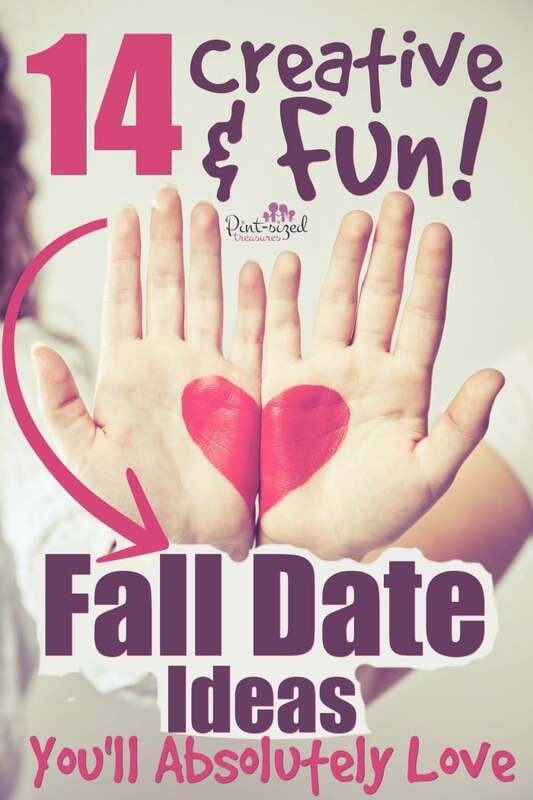 Fall is the perfect excuse to go on more dates with your husband, or plan some extra fun at-home dates! To celebrate the best season ever, here are 14 date ideas to get you and your husband having some mushy fun! Go on a hay ride. Yep, it’s kind of countrified, but it’s fun! The outdoorsyness of the moment gets everyone giddy and smiling — including your hubs! Go on a serious search for the best pumpkin latte. Check out your fave coffee shop’s newest version of the pumpkin latte. Share a small cup with your spouse then head on to the next coffee spot to check out their version. Don’t stop until you find the perfect cup!You’ll probably want these pumpkin muffins to go with it! Check out the local fair or festival. Chili cook-offs, pie contests and more are super popular during the fall. Go have some fun and enjoy all the tastes and smells of fall! Make s’mores. Build a cozy fire in the fireplace and roast some marshmallows. Don’t want to make a fire? Check out this s’mores making machine that will get the job done without the fire. Either way, it’s a great excuse to enjoy a fun treat with your spouse. Definitely try our super simple, Sweet and Salty S’mores that were featured on Huffington Post and BuzzFeed! Play tourist. I bet there are some really cool local museums, fancy restaurants and even historic sites in your city that you and your hubby have yet to discover. Make a night of it, grab a map and take pictures. Tonight, you’re a tourist! More Fun Fall Date Ideas! Find an orchard. Have you ever picked apples? Why not start today? You and your hubby can pick apples and then return home to make your own applesauce, apple pies, apple streudels and apple cider! Yum! Rake and play in the leaves. Who said leaf jumping was only for kids? See who can rake the highest pile of leaves, then show off your very best jumps! Cannonball into a pile of leaves? Why not?! Go for a scenic drive. Wow, the leaves are just plain gorgeous during the fall. In my opinion, Pennsylvania has some of the most gorgeous trees ever! Take a drive and get ready for some impromptu photos to capture the beauty you two are taking in! Add some extra fun and rent a convertible for the day! Have a football drive-in in your yard. Grill out with your hubby and watch his favorite game outside when you build this diy outdoor movie theater. We actually did this indoors for a Thanksgiving party and it went over VERY well with the guys! Buy a hammock and relax. I am a sucker for hammocks. I mean I could lay in one of those things all day with my hubby. Grab a fave book and read it out loud together while you enjoy the fresh smells of fall and all the beautiful sounds of nature. Order a seven course meal for take-out. My hubby and I did this recently and it was so much fun! We ordered some appetizers and salads from a few different restaurants and just shared it. We loved trying all the new dishes that we didn’t normally purchase and it was a cuisine adventure in our own bedroom — in our jammies! It’s so much more cozy to eat in your bedroom than at the dining table, isn’t it? Go to a local sporting event.A cheap, local way to enjoy some sporty fun with your hubs. Don’t forget to share some nachos and cheese! Go rollerblading or skating. Anything that tempts me to hold my husband’s hand 24/7 is a go for me! Check out the pumpkin patch. Oh! I loooooove pumpkins! So cute to decorate with and so many pumpkin recipes to make! You and your husband can go on a hunt to find the best pumpkin ever, and then take it home, toast the seeds and make pumpkin butter, pumpkin pie, pumpkin cheesecake, pumpkin soup and more! Do you have any fun fall date ideas? Share them with us!